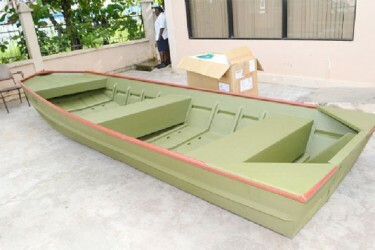 AChenapau village (Potaro/Siparuni) yesterday received an aluminum boat and a 40- Horse power engine, handed over through the Ministry of Amerindian Affairs, the Government Information Agency said. 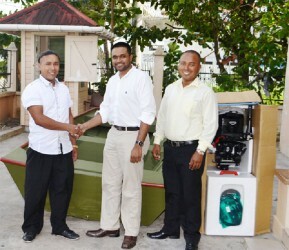 The items were presented to the Village’s toshao David Garcia by Permanent Secretary, Nigel Dharamlall at the Amerindian Affairs Ministry in Thomas Street. Dharamlall, according to GINA, said that the village requested from President Donald Ramotar a boat and engine to transport the children from the village to their school in Mahdia. “It is one of the most remote villages in Guyana, hence his Excellency thought that it is important as part of widening education development as our country is working towards universal secondary education,” Dharamlall explained, according to GINA. Many of the students of Chenapau attend the Mahdia Secondary School and transportation is one of their challenges, GINA said. The boat and engine are valued at $1.5M.